-All directors and adjudicators are invited to a catered lunch in the Werner University Center, Santiam Room. -Students may roam free, with chaperones or be escorted by a WOU Choir member to desired lunch areas. 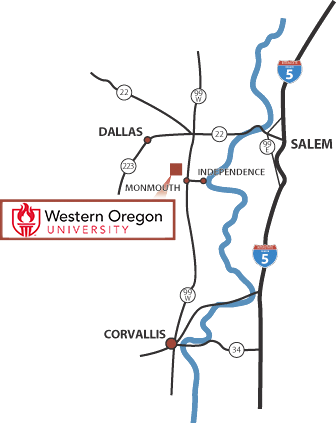 WOU’s picturesque campus is located in Monmouth, 20 minutes from the state capital of Salem in the heart of the Willamette Valley. About an hour from Portland, Eugene and the Pacific Coast, Monmouth has a population of approximately 8,000 residents. Take Exit 249 (Commercial Street). Follow Commercial into Salem, and as you near downtown, Commercial will curve to the right and become Liberty Street. Stay on Liberty until you reach Marion Street. Turn left, cross the Marion Street Bridge on to Highway 22, and follow the signs marked “Dallas/Ocean Beaches.” Stay on Highway 22 until you reach Highway 99W. Take exit 16 on the right side of the overpass that puts you on Highway 99W. Go south about six miles to Monmouth. Take a right onto Main Street at the stop light. Follow Main Street west to Monmouth Avenue and turn right. Take Exit 228 and follow route 34 west towards Corvallis. After crossing the Willamette River into Corvallis, turn right at the second light onto scenic highway 99W. Continue north about 20 miles until you reach Monmouth. Turn left at the first stop light, onto Main Street. Follow Main Street west to Monmouth Avenue and turn right. Take Exit 260A (Salem Parkway). Follow the Parkway into Salem. The Parkway will curve to the left and become Commercial Street. Stay on Commercial until you reach Marion Street. Turn right, cross the Marion Street Bridge on to Highway 22, and follow the signs marked “Dallas/Ocean Beaches.” Stay on Highway 22 until you reach Highway 99W. Take exit 16 on the right side on the overpass that puts you on Highway 99W. Go south about six miles to Monmouth. Take a right onto Main Street at the stop light. Follow Main Street west to Monmouth Avenue and turn right. 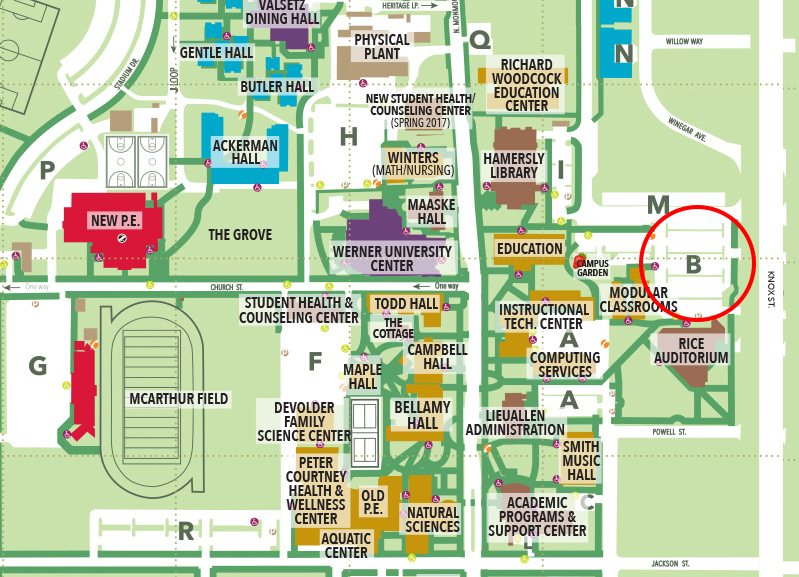 Buses may drop students off near either Rice Auditorium or Smith Hall in Lot B. Bus and car parking will be available in Lot G on those days.